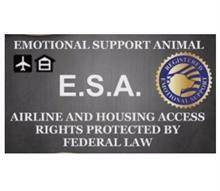 With Emotional support dog identification, you will be able to identify your dog as an Official ESA (Emotional Support Animal). 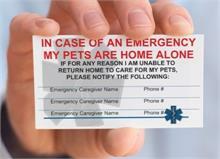 We offer Official ID cards and badges that can allow the public to see that your dog is assisting you, and is not a pet. When you are out in public with your emotional support dog, having a type of ESA ID at all times will help avoid any confrontations. Doing the necessary steps, along with registering your emotional support dog will ensure your emotional support animals’ rights’ in public. Emotional support dogs offer comfort and support for a psychological or emotional condition, but can be confused with a Working Service Dog. 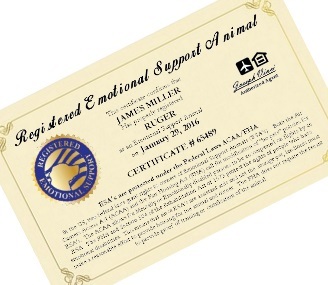 As such, when you’re out in public, it can be quite helpful to have some type of emotional support animal certification on hand to provide distinction of what kind of service your ESA is providing, and to avoid confrontations that may exacerbate your condition. We offer several non- certification ID card products, each displaying pertinent information such as your full name, address, city, state, ZIP, and your dog’s name. 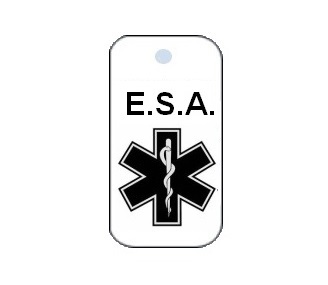 We also offer a variety of designs, including a paw print design, the Star of Life (typically seen in an EMS capacity), or an American flag that is ideal for veterans. Our Official ID cards are made from heavy, durable PVC plastic, like credit cards, and are made to last and our ID cards are sturdier than the typical laminated paper cards you may see on other websites. 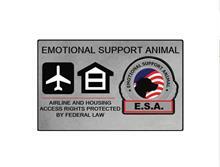 Many among the public simply do not know what an emotional support animal is. Even fewer know the difference between an ESA and a working service dog. We are dedicated to offering you the full range of ID cards and products to help you show this important distinction to anyone who asks. Your companion animal, combined with products from WorkingServiceDog.com, can help bring you comfort and support whenever you need it.